Every year, CCMI works hard to understand our coral reefs and the role humans have in protecting and conserving these natural resources for generations to come. However, we could not do this on our own, and CCMI wants to show what an incredible network of support we have in conducting the critical research on our reefs and in educating our students and the general public alike. As they say, ‘it takes a village’. This could not be a truer statement when it comes to the work we are entrusted with in learning about and protecting our coral reefs. 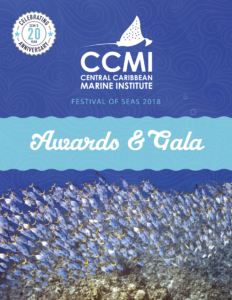 For individuals and organisations interested in supporting CCMI’s ongoing work while honouring those excellent community members who are award nominees and winners, we invite you to consider the various different sponsorship opportunities available.